Peter Wallace wouldn’t mind going around for one more season in 2019 but it’s likely that he’ll confirm his retirement at some stage in the next few months. The skipper knows his days in Penrith’s number 9 jumper are numbered, especially now that the club has blooded Wayde Egan in first grade. Wallace doesn’t want to go to England and is likely to stay connected with Penrith, potentially in a coaching capacity. 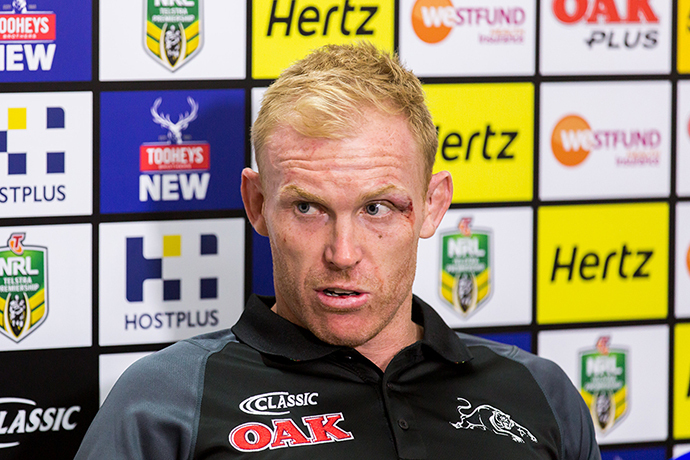 Penrith only ever wanted to sign Wallace to a one-year deal for the 2017 season, but he managed to secure a two-year contract that expires at the end of the season. What is driving Wallace is his desire for a Premiership ring. Let’s hope the rugby league Gods are shining on him and he gets it in 2018. The future of Josh Mansour remains a huge mystery. He hasn’t had the most dynamic start to the season, which has a number of Penrith officials wavering on what he’s worth. 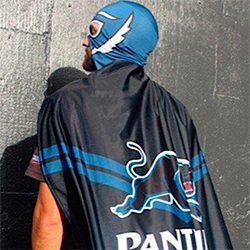 The rampaging winger loves the Panthers but with no real ties here, he’ll most likely end up at the club that can offer the best deal. As it stands, that’s shaping up to be Parramatta. Forward Andy Saunders has returned to Penrith after reportedly falling out with Wentworthville Magpies ISP coach Nathan Cayless. Saunders left the Panthers a couple of years back and earned his NRL debut with the Bulldogs, but Des Hasler’s departure left him out in the cold. He signed with the Magpies just before Christmas last year but things didn’t work out. He’s now back home at Penrith. 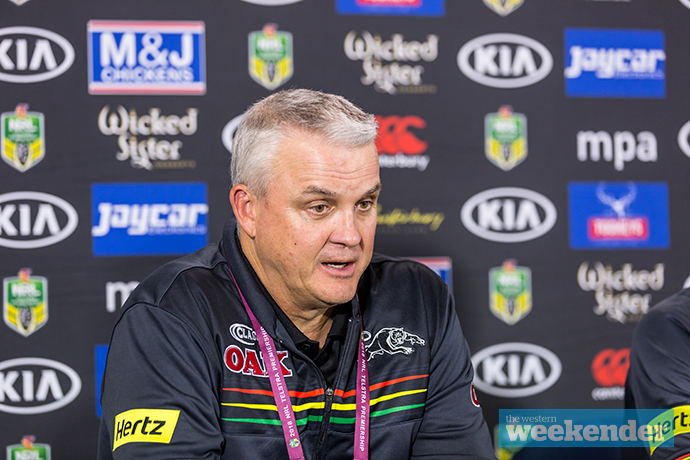 For whatever reason, Panthers coach Anthony Griffin played games with the first grade team list for the match against the Cowboys last weekend. Jarome Luai was named in jumper 14 but knew he was never going to play. Wayde Egan, who was named on the extended bench, was told early in the week that he would most likely make his first grade debut. Unfortunately the NRL’s team list rules, while much stricter these days, still leave it open for coaches to pull a swifty. I’m not sure who it benefits really, but Penrith is yet to take the field this season with the team they named on the Tuesday, so Hook must think he’s fooling somebody. Spotted: Peter Wallace turning up to the post-match press conference in Townsville last Thursday night wearing Jarome Luai’s warm-up / training shirt. Nathan Cleary is secretly targeting the round 11 clash against the Wests Tigers as his return match for the Panthers. The game has obvious extra meaning given Nathan’s father Ivan is at the helm of the Tigers. If he does make it back for the battle of the big cats at Panthers Stadium, there’s still a chance the youngster could be selected in Brad Fittler’s Blues side for Origin I. Meanwhile, Cleary was spotted at the front end of the plane back from Townsville last Friday. He copped plenty of ribbing from the rest of the team, who were seated back in economy. Truth is Cleary needed a business class seat due to the size of his leg brace. Still on Cleary, he’s leading the Dally M medal count after four rounds and according to Sportsbet remains an outside chance of claiming the game’s greatest individual honour. His odds have blown out to $67.00. Viliame Kikau has given up some of the Fijian delicacies he loves so much in an effort to keep his fitness levels up, but he can’t resist a post-match Kava. Kikau has tried to convince a few other team mates to jump in and try his traditional after match elixir, but nobody seems keen to join him. Isaah Yeo has recovered well after taking that big hit against the Cowboys last Thursday night, but he’s not keen to talk about it. In fact, Yeo requested that journalists refrain from asking about the concussion and his injury at the club’s open media session on Monday afternoon. 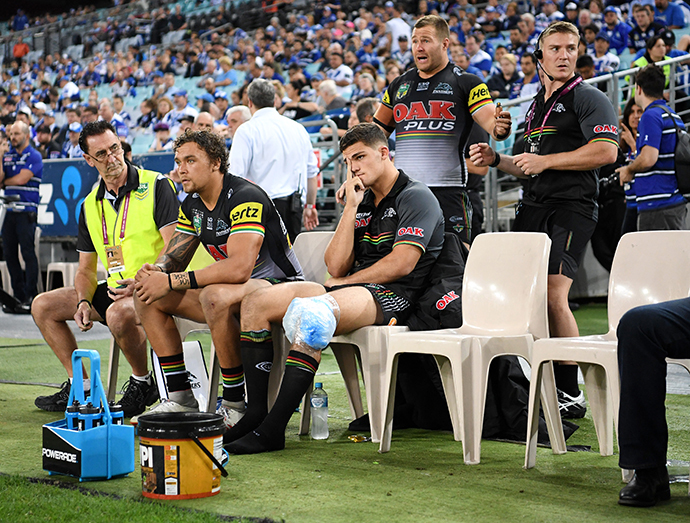 Plenty of people tuned in to watch Penrith’s upset win over the Cowboys last Thursday night. Channel Nine’s telecast attracted 653,000 viewers (including regionals) while a further 186,000 watched on Fox League.